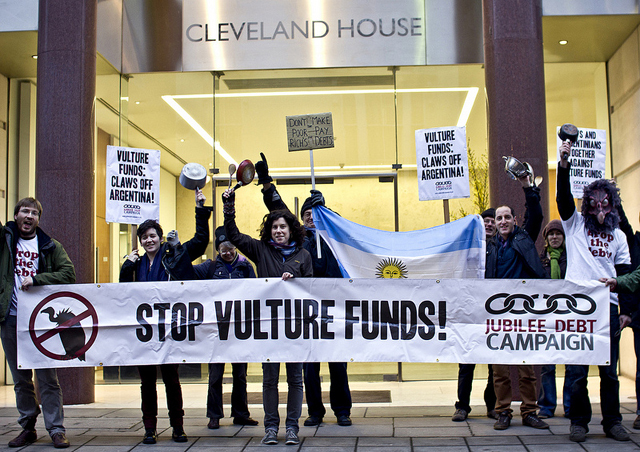 The US Supreme Court has today refused to hear Argentina’s appeal against vulture funds who are seeking a huge profit out of the South American country, whilst possibly forcing Argentina to default on its debt. The case shows that the global debt system is stacked in favour of rich speculators and against the needs of ordinary people. The vultures, known as NML Capital (a subsidiary of Elliot Associates) and Aurelius Capital, never lent any money to Argentina, but are trying to make a huge profit out of speculating on Argentine debt. In the 1990s, Argentina closely followed IMF economic policies. With a deregulated financial system, money flooded into the country, then flooded out in the wake of the Asian Financial Crisis. This resulted in a government debt crisis in the late 1990s and early 2000s. Debt payments increased to a completely unaffordable 45 per cent of export revenues, whilst the percentage of the population living in extreme poverty shot up from 3% to over 20%. Argentina defaulted on its debts over Christmas 2001, as the government ran out of money. The government subsequently reached an agreement with the vast majority of private creditors to pay 25-30 cents on every dollar owed, spread over several years. Since 2005, these payments have continued to be made. Furthermore, the interest rate on the new debt was tied to Argentina’s growth; the better the economy performed, the more the creditors were paid. And with the debt reduced and no longer on IMF programmes, Argentina’s economy has done well, extreme poverty has fallen to less than 2%, and inequality is also well down on the heights reached in the wake of the crisis. The vulture funds bought up some of the debt on the cheap after Argentina defaulted. It is estimated they paid 20 cents or less for every dollar of debt. The vultures are now demanding that Argentina pay the debt in full, which one analyst has estimated would represent a profit of 1,400%. Outrageously, NML Capital and Aurelius have managed to convince a court in New York that Argentina should either pay them in full, or not pay anybody. Argentina’s payments to the vast majority of creditors who agreed to negotiate are routed through New York. So if enforced, the New York judgement could make Argentina default. Having lost two appeals, Argentina has asked the US Supreme Court to take up the case. The Supreme Court announced today that it will not take up the case, though Argentina will have another chance to request it. Because of its gigantic financial centre, the UK has also been a home to similar vulture funds suing for mass profits, against countries including Zambia, Liberia and the Democratic Republic of Congo, which international debt relief had been agreed for just a couple of years earlier. In 2010, Jubilee Debt Campaign got the British parliament to pass a ground breaking law, which said the vultures cannot sue in UK courts for more than they would have got if they had taken part in the debt relief initiative. The UK law, now also passed in Jersey, Guernsey and the Isle of Man, is severely limited in that it only applies to old debts of the 40 impoverished countries which have or are going through this particular debt relief scheme. But it shows it is legally possible to make vulture funds comply with debt reductions agreed by everyone else. Rather than leaving the decision to legal whims, the US Congress could pass a law saying vulture funds can’t sue Argentina for more than they would have got if they’d taken part in the agreed debt reductions. Or a previously proposed Congressional law could be resurrected which says vultures can only sue for a certain percentage of what they paid for a debt. A law passed by the US Congress, based on the British law, could stop the vultures in their tracks. We also need public support for debt audits, and the creation of a fair, independent and transparent arbitration process for getting rid of unsustainable and illegitimate debts, to put an end to these greedy speculators who give vultures a bad name. Can Mozambique declare the $2 billion secret debts illegal? Argentina is facing record debt and is on the road to hell. There is only one way out.